Paddy Power are well known on the high streets of the UK and Ireland through their betting shops. Originally a sports betting company but know expansion into the world of online gaming and betting is massive and they cover casino, virtual sports, poker, bingo and lottery betting. They even have a live casino product with real life dealers for roulette, blackjack and other great games like Baccarat and Casino Hold'em. UK & IRL only. Deposits made with e-wallets are not valid for this promo. Bonus wagering x35 on eledible games. Winnings from bonus capped at £500. Spins available after bonus is redeemed/lost. 10 per day with no wagering. Full T&Cs apply. The online casino offers games mainly from casino software developing giant Playtech. All the latest games are available inclusing the all new DC Comics Batemand and Superman range. There are over 350 different online slots and fruit machine style games to choose from, many offering free spins and bonus games for bigger wins. There are also great jackpots available through network games like Beach Life and Gladiator. Head over to Paddy Power Casino using the direct links from this page and you will be greeted with a free great bonus offer added to you account as soon as you sign up and make a £10 deposit. Redeem your bonus and start playing the amazing online casino games that Paddy Power offer. To get you started you can claim 20 free spins on the great online slot SPACE INVADERS. This is a great retro game by Playtech. You are give 10 spins on the day your bonus is complete and 10 more FREE SPINS on the following day. 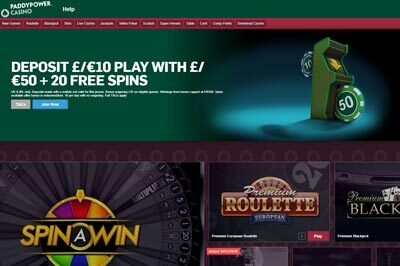 Paddy Power online casino are full of bonuses and promotions, keep playing and checking for the latest offers to help you get the most of the ultimate casino experience. The deposits are easy and withdrawals simple and direct to your bank within 3-5 days. Paddy Power Casino have many other weekly and monthly promotions, such as cash races and points competitions. The games are fair and your money is safe with a UK licencing guarantee. It is a great place to play all your favourite games. In addition to standard casino games Paddy Power also offer more casual games like fixed odds arcade games such as bowling and Keno. they also have a great range of instant scratch and win cards for prizes of up to £50,000. Get yourself in with Paddy for a truly great online casino experience. The UK casino is fully regulated and all games are tested for fairness and equality. All this with a greatnew player DEPOSIT BONUS - CLAIM IT TODAY! And don't forget your 20 FREE SPINS!